Haq's Musings: Must Barack "Barry" Obama Give Up His Barackberry? Must Barack "Barry" Obama Give Up His Barackberry? 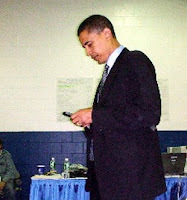 Will President-elect Barack Obama be allowed to keep his favorite Blackberry when he takes office on January 20, 2009? This question is being raised in Washington by those who see a conflict between the US law and the use of technology by a US president. The need to answer such a question did not arise because all of the US presidents to date have not been tech savvy. It is alleged that George W. Bush did have an email account prior to becoming president but he gave it up at the insistence of secret service. Pointing out the dangers of presidential isolation, Jonathan Alter of Newsweek puts it as follows: "Bush foolishly listened to the security people who made him give up his e-mail account in 2001. The result was that old friends suddenly found they had no way to get through to the president. More than a few watched in horror as he drove the country over the cliff." Variously described as Barackberry or Crackberry, president-elect Obama is reportedly addicted to the smart phone he uses for keeping in touch with his friends, supporters and campaign staff and to surf the Internet. The US law, however, imposes several restrictions on the communications of the president of the United States. In addition to email security, there is the Presidential Records Act, which puts all presidential correspondence in the official record and ultimately up for public review. A laptop might be permissible in the Oval office but it is still uncertain. If Mr. Obama does surrender his Blackberry, it will represent a rather inauspicious start for America's first "technology" president. Obama understands the difference that online networking technology made in raising record amount of $700m for his campaign, and energizing the young people to get involved as campaign organizers, workers and voters. He must continue to promote and use the online media to reach out to the American people and inspire them to bring real change in America. Obama campaign has talked about appointing a Chief Technology Officer (CTO) to oversee US technology policy investments in the incoming Obama administration. The cabinet-level CTO’s mandate would be different from the lower level Cybersecurity czar appointed under the Bush Administration. Bush’s czar helped defend against cyber threats. Obama’s CTO, by contrast, would ensure government officials hold open meetings, broadcast live webcasts of those meetings, arrange President Obama's fireside chats online, and use blogging software, wikis and open comments to communicate policies with Americans, according to the plan. Such broad use of online media by the US government will benefit Silicon Valley high-tech businesses and encourage the use of technology by state and local governments in the US and other parts of the world. The use of technology will keep a lot of young people, who were energized by Obama, engaged in discussion and help solve major national issues. "Obama understood the intersection of demographics and technology and promised engagement and interaction," Don Tapscott, best-selling author and researcher, said in an interview recently. "But if he now says to young people, 'Thanks, now go passive for four years until my re-election,' there will be outrage. It will make the reaction of the 1960s generation look like kid stuff." The technology exists for Mr. Obama to improve government transparency and pursue the online relationships with his under-thirty supporters. However, Mr. Obama will have to make sure that people he surrounds himself with in the White House can take advantage of it and the laws are suitably amended to make the White House technology friendly. If Obama does manage to use the modern online technology and social media applications to maintain close contact with supporters just as he did during his highly effective campaign, he can potentially go over the heads of the established legacy media, the powerful Washington lobbyists and the obstructionist US Congressmen to energize and sustain support for his ambitious agenda of change. Such a simple solution that would likely allow a Presidential Blackberry is available, an archive product that will archive everything he sends/receives with his blackberry. If paper copy is needed, it can just all be printed out in addition to being readily search able where needed and authorized. According to CNN and other media reports, Obama will keep his Blackberry as president. "The president has a BlackBerry," White House Press Secretary Robert Gibbs said Thursday, clearing up weeks of speculation about whether President Obama would be able to hold on to a cherished method of communicating. The decision to allow Obama to keep a smartphone is "a compromise that allows him to stay in touch with senior staff and a small group of personal friends," Gibbs told the media in his first press conference since the inauguration. "Use will be limited and the security is enhanced to ensure his ability to communicate but to do so effectively," Gibbs also said. "And to do so in a way that is protected." The press secretary refused to provide more details about the new president's device, already being called the "BarackBerry."